Abhishek Singh, Freelance Website Designer Developer in Delhi, India. “Do you need a professional website with customized look and feel? Are you looking for a website designer who can make your website just the way you want? Voila you are at the right place. I am Abhishek, i am a freelance web designer in Delhi. 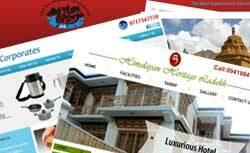 I have been designing websites for last 7 years. Creating websites is my profession as well as passion. I am experienced, website designer, graphic designer and seo professional. I believe in the virtues of quality, sincerity, professionalism and honesty. Ever since i created my first website i have formed a bond with my first and newest clients. I believe in long term associations. I understand my clients needs and requirements give a patient ear to each and every details. I have worked on more than fifty website projects and my list of satisfied clients keeps growing. I work on html, wordpress, joomla, flash, php . I believe in doing original work. Client satisfaction is truly important for me. I have designed websites for companies, small business, artists, professional and international clients too. For me each client is important. I am a self taught website and graphic designer. I love music, arts and sports.